To control vehicle behavior, it is essential to estimate tire force accurately at all times. However, it is currently difficult to detect tire performance degradation before the deterioration of vehicle dynamics in real time because tire force estimation is usually conducted by comparing the observed vehicle motion with the onboard vehicle-model motion baseline reference. Such conventional estimators do not perform well if there is a significant difference between the vehicle and the model behavior. The lack of technology to easily predict tire forces and road surface friction is concerning. 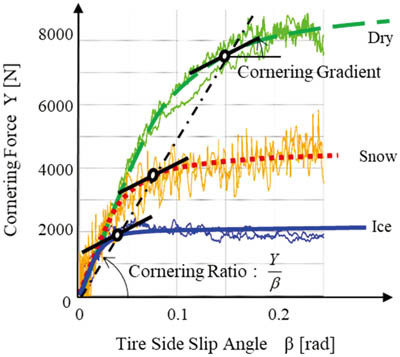 In this paper, a new tire state estimation method based on tire force characteristics is proposed. Y. Shiozawa and H. Mouri, “Tire Characteristics Estimation Method Independent of Road Surface Conditions,” J. Robot. Mechatron., Vol.30, No.1, pp. 138-144, 2018. Japan ABS Co., Ltd., “Research of car ABS,” Tokyo, Sankaido, p. 190, 1993. S. Monzaki, “Prevention safety characteristic improvement due to P-stability control,” TOYOTA Technical Review, Vol.56, No.2, pp. 44-50, 2009. R. Chaichaowarat, “Linear Quadratic Optimal Regulator for Steady State Drifting of Rear Wheel Drive Vehicle,” J. of Robotics and Mechatronics, Vol.27, No.3, pp. 225-234, 2015. N. Wada, “Vehicle Yaw Control Using an Active Front Steering System with Measurements of Lateral Tire Forces,” J. of Robotics and Mechatronics, Vol.23, No.1, pp. 83-93, 2011. K. Seto, “Traction control suitable for electric motor driven car,” Japan Society of Mechanical Engineers Lecture Thesis Collection, No.994-2, pp. 323-324, 1999. S. Sakai, “Tire slip detection method not requiring car velocity information for electric cars,” Pre-lecture collection for the Society of Automotive Engineers of Japan, Inc., May 1999, No.22-99, No.99, pp. 1-4, 1999. M. Abe, “Vehicle Handling Dynamics, Second Edition: Theory and Application,” Butterworth-Heinemann, 2015. W. F. Milliken, “Race Car Vehicle Dynamics,” SAE, pp. 473-487, 1997. H. B. Pecejka, “The Magic Formula Tire Model,” Proc. of the 1st Int. Colloquium on Tire Models for Vehicle Dynamics Analysis Held in Delft, 1991. M. Mizuno, “Magic Formula Tire Model Using the Measured Data of a Vehicle Running on Actual Road,” Proc. of the Int. Symposium on Advanced Vehicle Control 1998, Nagoya, Japan, pp. 329-334, 1998.